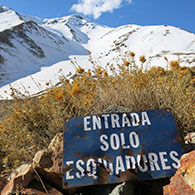 Mix up your usual fall schedule with a visit south of the equator- ASI style! If you are looking to expand your ski touring horizons, ski big peaks and ancient forests, and kick off your winter right this trip was made for you. This trip was designed for those with a background in backcountry skiing, perfect for those who have joined us on Shasta or around the Tahoe area.